There are function to do this using the include file string.h. if the strings are the same result will remain 1, if not result = 0. Boy am I glad to see some activity, I swear I learn something with every question. Strings must be null terminated. Best not to leave it to chance and always allocate an extra byte for the null terminator and then be sure it is a null character. I agree. I still am having problems with strings & my radio setup. I think I will try some of these ideas..
Eric & Noter.. thanks for the time to help. stupid leds wont light up anymore. I need to understand this strcmp and memcpm a little better. 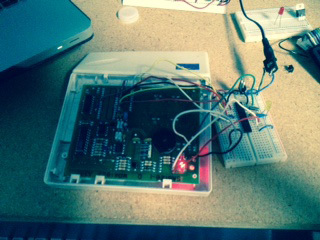 here is my home alarm code with the original keypad, buzzer, leds. I just need to hook the pir sensors to ADC. I am sure this could be better, but it works fine for now :) I might look into debouncing the buttons and once I get a new serial cable I am thinking in doing a python script to send an email or maybe make a SIP call to let me know if the alarm fired off. Thanks for your help, I had a hard time trying to work that password match. let me know what you think and if you catch any thing that could go wrong. For those of you interested in how string functions work; I've written these which you can use, and learn from. They aren't -super-tight-, but they are adequate for most things. My goal was that they be educational/useful. *          exceeds this, (unlikely) it will roll. *          this is left as an exercise for the caller. *          byte. If same, including length byte, we return TRUE. As an additional note-- you may have to typedef TRUE and FALSE for your implementation. I know that I prefer to. escartiz, I hope you post your project on dropbox or some other public forum. I need some thing similar to what you are doing, especially the email notification of event.